However, many dancers experience the opposite scenario, complaining of sore hips after just few weeks of using weights. While it is reasonably common practice in many dance schools, using weights on the legs during class must be used with caution. Using weights on the legs may be beneficial but should only be used when the dancer demonstrates excellent technique and control without the weights. For example, it may be suitable for a professional classical dancer who has exquisite placement and range who wants to build endurance and control to survive a full season. However, I do not believe that weights should be given to student dancers in an attempt to get their legs higher. If weights are added before a dancer knows how to correctly articulate the hip in the socket and coordinate this action with subtle control of the pelvis, they will simply overuse the muscles that they are already (incorrectly) using. Many people think that strengthening the hip flexors will result in higher legs. This is technically true, however, there are several different hip flexors which need to be trained very specifically to support the leg en l’air. 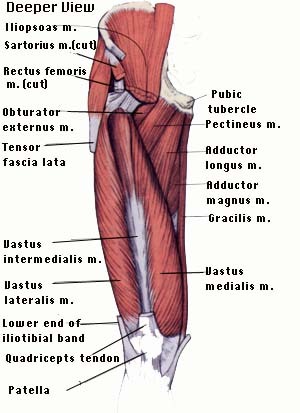 Resistance training often overloads the superficial hip flexors (TFL and Rectus Femoris) rather than strengthening the deeper layers of Iliacus and Psoas Major. Repeated overuse of the hip flexors under load, without the appropriate patterning, often results in inflammation of the front of the hips, and this is especially common in young dancers. In addition, deep back control and dynamic core stability is an essential element in getting the Psoas Major to actually function as a hip flexor, so retraining for increased height of legs needs to start with some very specific deep core control exercises, rather than loading the legs. To read more about how this works, check out our article on hip and back pain. If you have been told to use weights in class and are concerned about this, I would suggest gently approaching the teacher after class and raising your concerns. Ask if there are any other technique issues that they have noticed that can be worked on without the use of weights. If needed, have a private lesson with the teacher to gain confidence in using all of the correct muscles, but do not use weights if they are loading the hips in an uncomfortable way. A better way of loading the hips to improve strength is by using Band-ITS, a resistance training system that actually helps fire up the deep stabilisers and centralise the head of the hip to develop good articulation of the hip in the socket. For more information on Band-ITS and how they can help your dancing - CLICK HERE. In our new program aimed at getting the legs higher in a devéloppé devant (coming soon) we focus on understanding each element that goes into effortless extensions, and training these separately, before putting them together. This results in much better technique all round and helps get the legs lifted without any discomfort in the hips. You will also learn how to really isolate and feel the muscles that should be used in class more specifically, which helps prevent injuries of the knees and lower leg.